The maiden voyage of a solar-powered airplane took place today in Switzerland without any problems. The plane is designed to fly day and night, without any fuel, so there are absolutely no emissions. The plane is called the Solar Impulse and it has 12,000 solar cells built into its wings. 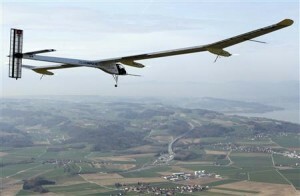 It is a prototype for another plane that will fly around the world without any fuel in 2012. If solar energy can power an airplane I think that it can handle our day to day electric needs as well. It may all still sound like science fiction, but the future has arrived and we get to be a part of this amazing change in how our energy needs are met. An important next step is for us to realize that it is possible, and it is happening already on a fairly large scale. It is up to each of us to seek out these alternatives and to demand them from our utility companies. We were just reminded of the inherent dangers of coal mining this week with the explosion Monday at a Massey mine in West Virginia, and the damage to the environment and local citizens is an ever present reminder that we need to move off of coal to power this country and in fact the world. Let the sun shine in and let us use the immense power that is available from the sun.